Diabetic retinopathy (DR) is a severe and widely spread eye disease increasing in incidence as the worldwide number of patients with diabetes grows. Thus, an objective test for the early diagnosis and evaluation of treatment in DR is certainly needed to identify the individuals at great risk for vision-threatening problems. Several studies ,,,,,, showed that retinal neuronal abnormalities are present at the early stages of DM. These abnormalities as retinal ganglion cell (RGC) death and axonal degeneration should increase with increasing DM duration, and this reduces the RNFL thickness. The early detection and intervention to prevent these neuronal abnormalities might prevent neurodegeneration. The role of the OCT in the assessment and management of the diabetic retina has become significant in understanding the vitreoretinal relationships and the internal architecture of the retinal structure. OCT images can either be used to qualitatively assess retinal features and pathologies or to objectively make quantitative measurements which is especially important in the early stages of DR when the structural changes are not yet evident with slit-lamp biomicroscopy or angiographically. This study aims to evaluate the thickness of the macula in participants with diabetes but without diabetic macular edema (DME) using OCT and compare these findings with measurements from normal controls which may be useful for early detection of macular thickening. This Study was a prospective comparative case-control study. Group 4: Diabetic Patients with PDR and without DME. These participants were chosen randomly from patients attending the general Ophthalmology and retina clinics of Sohag University Hospital. Approval of the Faculty Ethics Committee was obtained and written informed consent was obtained from each participant. The study was carried out from March 2015 to February 2016. Full ophthalmological evaluation including visual acuity (VA), intraocular pressure (IOP), slit-lamp biomicroscopy, examination of the fundus with the slit lamp biomicroscopy and indirect ophthalmoscopy. Fluorescein angiography was done when indicated. We used the Topcon™, 3D OCT-2000 machine to perform the fast macular scan which gives 3 concentric circles: 1, 3, and 5 mm in diameter centered on the fovea. The 3 and 5 circles are each divided into nasal, temporal, superior, and inferior quadrants [Figure 1]. Figure 1: Macular sectors. 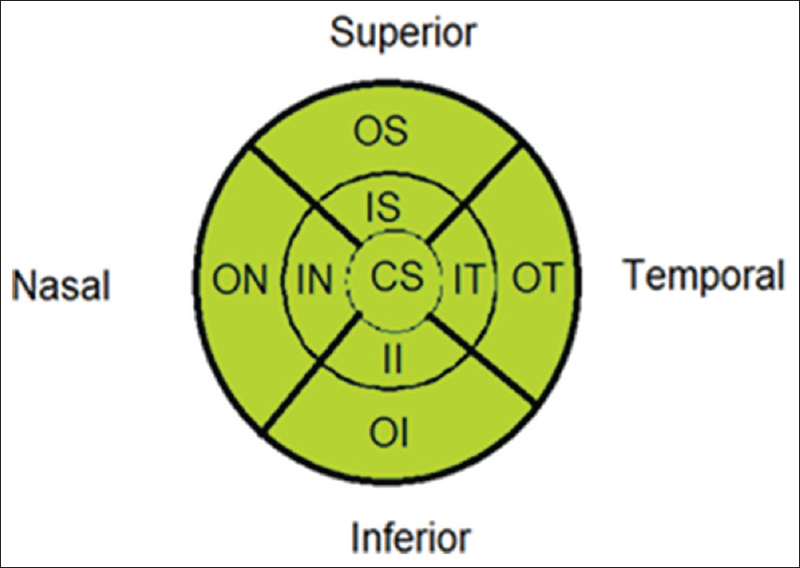 CS: Central subfield, IS: Inner superior, IN: Inner nasal, II: Inner inferior, IT: Inner temporal, OS: Outer superior, ON: Outer nasal, OI: Outer inferior, OT: Outer temporal. The mean ± standard deviation (SD) of macular thickness by area in these eyes were analyzed and compared. The machine was operated by two of the authors (S.S and A.E), and the calculations and revisions of the scans by them and by (M.E and A.I). All analyses were performed using SPSS for windows version 16.0 (SPSS, Inc., Chicago, IL, USA). Data were expressed as mean ± SD. Independent t-test was used to make statistical comparisons. P < 0.05 was considered statistically significant. This study included 200 eyes divided into 4 groups; group 1 included 50 controls, group 2 included 50 diabetic patients with no DR, group 3 included 50 diabetic patients with NPDR and without DME, and group 4 included 50 diabetic patients with PDR and without DME. These individuals included 73 male (36.5%) and 127 female (63.5%). The mean age of control, NDR, NPDR, and PDR groups were (53.55 ± 8.34), (57.38 ± 11.29), (57.10 ± 6.94), and (52.96 ± 7.32), respectively. The clinical data and demographics of all subjects are shown in the table. Figure 2: A graph showing the thicknesses of the macular sectors in different groups. The CS sector was statistically significantly thicker in normal controls versus diabetics with no DR but not in other sectors. 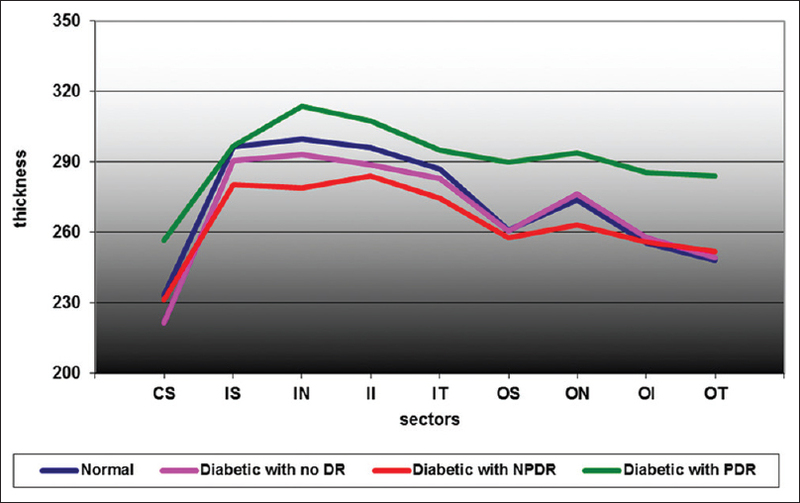 A statistically significant difference in thickness was found between inner sectors (IS, IN, IT, II) and the ON sector between normal and diabetics with NPDR groups but not in other sectors, the thickness being less in NPDR group. A statistically significant difference in thickness was found between all sectors except IS and IT on comparing normal versus diabetics with PDR, being thicker in normal controls. A statistically significant difference was found between nasal sectors (IN and ON) but not in other sectors on comparing diabetics with no DR versus diabetics with NPDR. A statistically significant difference was found between all sectors except IS on comparing diabetics with no DR versus diabetics with PDR. A statistically significant difference was found between all sectors on comparing diabetics with NPDR versus diabetics with PDR. The early diagnosis and early detection of functional changes related to DR that occur before retinal morphology changes are important for preventing DR. Some researchers have found that retinal neurodegeneration may occur in DR before any microcirculatory abnormalities can be detected. Although fluorescein angiography is highly sensitive for the qualitative detection of fluid leakage, which causes macular edema, measurements of retinal thickening may correlate better with areas of retinal dysfunction than does the amount of fluorescein leakage. OCT enables the clinician to show accurately subclinical retinal changes in the absence of CSME or the absence of any signs of DR by detectable fluorescein leakage. In this study, our OCT findings demonstrated that the central macula in the diabetic patients with no DR group was significantly thinner than that of the control group with mean (233.34 ± 29.15) and (221.38 ± 24.26), respectively. These results are comparable to Verma et al. who found a reduction in foveal thickness in patients with DM and no retinopathy compared to healthy controls. These results are not consistent with the past reports.,, One possible reason for this discrepancy may be the shorter duration of the DM in our NDR group than in the other studies, 5.48 ± 4.39 versus 7.9 ± 7.3 years in the data of Sugimoto. In addition, various signs of retinal neurodegeneration have been found postmortem in the retinas of diabetic donors without any microcirculatory abnormalities during ophthalmoscopic examinations performed the year before death. In addition, our findings showed that the central macular thickness with mean (221.38 ± 24.26), (231.30 ± 29.34), and (256.48 ± 39.62) gradually increased with the duration of DM with mean (5.48 ± 4.39), (13.96 ± 4.93), and (14.70 ± 4.17) years in diabetics with no DR, diabetics with NPDR, and diabetics with PDR, respectively, probably because of an increase in vascular permeability in the diabetic retinas. Because of the short duration of DM, early reduction of macular thickness due to neuronal degeneration was not masked by the increase in macular thickness associated with vascular leakage. Several studies, including ours, showed that retinal neuronal abnormalities are present at the early stage of diabetes. ,,,,,, The neuronal abnormalities may explain the thinner macular thickness if these developed before the increased vascular permeability. Neuronal abnormalities including RGC death and axonal degeneration should increase with an increase in the duration of DM, and in turn, reduce the RNFL thickness. Our findings that macula was thinner at the NDR stage but thicker in the PDR stage would suggest that the neuronal abnormalities may precede the vascular abnormalities. This may be due to increase in serous leakage that probably led to the swelling of the retina. In this study, comparing normal control group with diabetic patients with NPDR, we found a decrease in macular thickness in eyes with NPDR with statistically significant difference between inner sectors (IS, IT, IN, II) and only outer nasal sector. In addition, Vujosevic and Midena found that the outer retina may not be affected at the early stages of DM and concluded that automatic intraretinal layering by SD-OCT may be a useful tool to diagnose and monitor early intraretinal changes in DR. The drawback of this study is the relatively small number of participants. Further larger-scale studies are needed to study the differential affection of different macular sectors in different stages of DR to detect if there is a preferential affection of these different sectors. This study detected morphological changes in DM patients using OCT, confirmed that the loss of neural tissue begins in the early stages of diabetes. As diabetes develops, neurodegeneration may be masked by changes in vascular permeability that cause thickening of the retinal layers. Early thinning of the inner retina occurs in diabetes, even before visible vascular signs of DR. This supports the presence of a neurodegenerative process in eyes of patients with diabetes and warrants neuroprotective intervention to prevent neurodegeneration. The OCT may represent a good tool for identifying early signs of neurodegeneration in diabetic patients. These results may help in close monitoring of diabetic patients before developing DR.
Ciulla TA, Amador AG, Zinman B. Diabetic retinopathy and diabetic macular edema: Pathophysiology, screening, and novel therapies. Diabetes Care 2003;26:2653-64. Oshitari T. Non-viral gene therapy for diabetic retinopathy. Drug Dev Res 2006;67:835-41. Oshitari T, Roy S. Common therapeutic strategies for diabetic retinopathy and glaucoma. Curr Drug Ther 2007;2:224-32. Oshitari T, Hata N, Yamamoto S. Endoplasmic reticulum stress and diabetic retinopathy. Vasc Health Risk Manag 2008;4:115-22. Barber AJ, Lieth E, Khin SA, Antonetti DA, Buchanan AG, Gardner TW, et al. Neural apoptosis in the retina during experimental and human diabetes. Early onset and effect of insulin. J Clin Invest 1998;102:783-91. Takano M, Sango K, Horie H, Sato M, Iijima Y, Ohno S, et al. Diabetes alters neurite regeneration from mouse retinal explants in culture. Neurosci Lett 1999;275:175-8. Asnaghi V, Gerhardinger C, Hoehn T, Adeboje A, Lorenzi M. A role for the polyol pathway in the early neuroretinal apoptosis and glial changes induced by diabetes in the rat. Diabetes 2003;52:506-11. Oshitari T, Roy S. Diabetes: A potential enhancer of retinal injury in rat retinas. Neurosci Lett 2005;390:25-30. Nussenblatt RB, Kaufman SC, Palestine AG, Davis MD, Ferris FL 3rd. Macular thickening and visual acuity. Measurement in patients with cystoid macular edema. Ophthalmology 1987;94:1134-9. Puliafito CA, Hee MR, Lin CP, Reichel E, Schuman JS, Duker JS, et al. Imaging of macular diseases with optical coherence tomography. Ophthalmology 1995;102:217-29. Hee MR, Puliafito CA, Wong C, Reichel E, Duker JS, Schuman JS, et al. Optical coherence tomography of central serous chorioretinopathy. Am J Ophthalmol 1995;120:65-74. Yang CS, Cheng CY, Lee FL, Hsu WM, Liu JH. Quantitative assessment of retinal thickness in diabetic patients with and without clinically significant macular edema using optical coherence tomography. Acta Ophthalmol Scand 2001;79:266-70. Sánchez-Tocino H, Alvarez-Vidal A, Maldonado MJ, Moreno-Montañés J, García-Layana A. Retinal thickness study with optical coherence tomography in patients with diabetes. Invest Ophthalmol Vis Sci 2002;43:1588-94. Massin P, Girach A, Erginay A, Gaudric A. Optical coherence tomography: A key to the future management of patients with diabetic macular oedema. Acta Ophthalmol Scand 2006;84:466-74. Cabrera Fernández D, Salinas HM, Puliafito CA. Automated detection of retinal layer structures on optical coherence tomography images. Opt Express 2005;13:10200-16. Pires I, Santos AR, Nunes S, Lobo C. Macular thickness measured by stratus optical coherence tomography in patients with diabetes type 2 and mild nonproliferative retinopathy without clinical evidence of macular edema. Ophthalmologica 2013;229:181-6. Demir M, Oba E, Dirim B, Ozdal E, Can E. Central macular thickness in patients with type 2 diabetes mellitus without clinical retinopathy. BMC Ophthalmol 2013;13:11.
van Dijk HW, Kok PH, Garvin M, Sonka M, Devries JH, Michels RP, et al. Selective loss of inner retinal layer thickness in type 1 diabetic patients with minimal diabetic retinopathy. Invest Ophthalmol Vis Sci 2009;50:3404-9. Araszkiewicz A, Zozulińska-Ziółkiewicz D, Meller M, Bernardczyk-Meller J, Piłaciński S, Rogowicz-Frontczak A, et al. Neurodegeneration of the retina in type 1 diabetic patients. Pol Arch Med Wewn 2012;122:464-70. Cabrera DeBuc D, Somfai GM. Early detection of retinal thickness changes in diabetes using optical coherence tomography. Med Sci Monit 2010;16:MT15-21. Villarroel M, Ciudin A, Hernández C, Simó R. Neurodegeneration: An early event of diabetic retinopathy. World J Diabetes 2010;1:57-64. Antonetti DA, Klein R, Gardner TW. Diabetic retinopathy. N Engl J Med 2012;366:1227-39. Lecleire-Collet A, Tessier LH, Massin P, Forster V, Brasseur G, Sahel JA, et al. Advanced glycation end products can induce glial reaction and neuronal degeneration in retinal explants. Br J Ophthalmol 2005;89:1631-3. Barber AJ. A new view of diabetic retinopathy: A neurodegenerative disease of the eye. Prog Neuropsychopharmacol Biol Psychiatry 2003;27:283-90. Hee MR, Puliafito CA, Duker JS, Reichel E, Coker JG, Wilkins JR, et al. Topography of diabetic macular edema with optical coherence tomography. Ophthalmology 1998;105:360-70. Verma A, Raman R, Vaitheeswaran K, Pal SS, Laxmi G, Gupta M, et al. Does neuronal damage precede vascular damage in subjects with type 2 diabetes mellitus and having no clinical diabetic retinopathy? Ophthalmic Res 2012;47:202-7. Goebel W, Kretzchmar-Gross T. Retinal thickness in diabetic retinopathy: A study using optical coherence tomography (OCT). Retina 2002;22:759-67. Lattanzio R, Brancato R, Pierro L, Bandello F, Iaccher B, Fiore T, et al. Macular thickness measured by optical coherence tomography (OCT) in diabetic patients. Eur J Ophthalmol 2002;12:482-7. Sugimoto M, Sasoh M, Ido M, Wakitani Y, Takahashi C, Uji Y, et al. Detection of early diabetic change with optical coherence tomography in type 2 diabetes mellitus patients without retinopathy. Ophthalmologica 2005;219:379-85. Biallosterski C, van Velthoven ME, Michels RP, Schlingemann RO, DeVries JH, Verbraak FD, et al. Decreased optical coherence tomography-measured pericentral retinal thickness in patients with diabetes mellitus type 1 with minimal diabetic retinopathy. Br J Ophthalmol 2007;91:1135-8. Yang JH, Kwak HW, Kim TG, Han J, Moon SW, Yu SY, et al. Retinal neurodegeneration in type II diabetic Otsuka Long-Evans Tokushima fatty rats. Invest Ophthalmol Vis Sci 2013;54:3844-51. Simó R, Hernández C, European Consortium for the Early Treatment of Diabetic Retinopathy (EUROCONDOR). Neurodegeneration is an early event in diabetic retinopathy: Therapeutic implications. Br J Ophthalmol 2012;96:1285-90. Vujosevic S, Midena E. Retinal layers changes in human preclinical and early clinical diabetic retinopathy support early retinal neuronal and Müller cells alterations. J Diabetes Res 2013;2013:905058. Nilsson M, von Wendt G, Brautaset R, Wanger P, Martin L. Macular structure and function and the development of retinopathy in diabetes. Clin Exp Optom 2012;95:306-10. Nilsson M, von Wendt G, Wanger P, Martin L. Early detection of macular changes in patients with diabetes using Rarebit Fovea test and optical coherence tomography. Br J Ophthalmol 2007;91:1596-8. Valverde AM, Miranda S, García-Ramírez M, Gonzalez-Rodriguez A, Hernandez C, Simo R. Proapoptotic and survival signaling in the neuroretina at early stages of diabetic retinopathy. Molecular Vision. 2013;19:47-53. Barber AJ, Gardner TW, Abcouwer SF. The significance of vascular and neural apoptosis to the pathology of diabetic retinopathy. Invest Ophthalmol Vis Sci 2011;52:1156-63. Gardner TW, Abcouwer SF, Barber AJ, Jackson GR. An integrated approach to diabetic retinopathy research. Arch Ophthalmol 2011;129:230-5.
van Dijk HW, Verbraak FD, Kok PH, Stehouwer M, Garvin MK, Sonka M, et al. Early neurodegeneration in the retina of type 2 diabetic patients. Invest Ophthalmol Vis Sci 2012;53:2715-9. Carrasco E, Hernández C, de Torres I, Farrés J, Simó R. Lowered cortistatin expression is an early event in the human diabetic retina and is associated with apoptosis and glial activation. Mol Vis 2008;14:1496-502. Carrasco E, Hernández C, Miralles A, Huguet P, Farrés J, Simó R, et al. Lower somatostatin expression is an early event in diabetic retinopathy and is associated with retinal neurodegeneration. Diabetes Care 2007;30:2902-8.